Maddocks has signed a 10 year lease at Walker Corporation’s Collins Square Development. The $2 billion development, located at the western end of Collins Street, is one of the largest mixed-use commercial and retail developments ever undertaken in Melbourne’s CBD. Maddocks' announcement to relocate to Tower 2 the fourth building to be constructed within Collins Square, follows the firm's 12 month search for new premises through Pepper Property Group. Tower 2 has now commenced construction and, at 38 levels, it is the tallest commercial tower constructed in Melbourne’s CBD in over 10 years. With two of the five towers completed, along with the former Goods Shed and Lantern buildings, the Collins Square development is 100 percent leased and advanced discussions are now underway with a range of other professional firms for the balance of space within Tower 2. The new Maddocks premises will extend across three floors, continuing the shift of firms looking to consolidate into more efficient and flexible work space on larger floor plates from the traditional older CBD stock. Currently occupying six floors within 140 William Street, the Collins Square agreement provides Maddocks with an opportunity to connect floors through bespoke double storey winter gardens, along with atria stairs located in flexible positions. 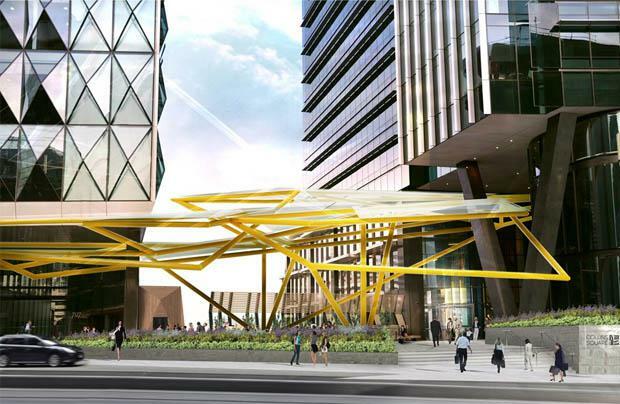 The announcement follows big four accounting firm KPMG’s earlier declaration to lease almost 30,000 square metres in the new Tower 2, Collins Square. Completion of construction is scheduled for mid-2016, with Tower 2 to provide a combination of unique accommodation solutions, including the 11-storey ‘Sky Village’ atop the building, as well as high and low-rise precincts featuring winter garden atriums and vertical 'spiral connections'. Tower 2 was designed by Melbourne’s award winning architects, Hassell Studio, achieving a minimum 5 Star Green Star Rating and minimum 5 Star NABERS Energy rating, with ecological water practices, light filled atriums, tri-generation, and high fresh air rates. Chairman of Walker Corporation Mr Lang Walker says, “We are excited to welcome prestigious law firm Maddocks to Collins Square, reinforcing its position as Melbourne’s leading new commercial, retail and hospitality precinct. “We are committed to providing 220,000 square metres of world class office, retail and entertainment space in Collins Square, with more than 100,000 square metres now delivered to many of Melbourne’s blue chip organisations and government," he continues. Tenants include Marsh Mercer, Transurban, Commonwealth Bank of Australia, the Commonwealth of Australia, Penguin Random House and Pearson, Sladen Legal and Mott McDonald. With 200 metres of frontage to Collins Street, Collins Square has consolidated its position as the premier destination for the western end of Melbourne’s CBD, where all existing commercial space is now leased. More than $8.5 billion of development has now been completed in the western end of the CBD, boasting the highest concentration of environmentally sustainable buildings in the Southern Hemisphere. Collins Square includes a newly opened childcare facility located in the heritage listed Goods Shed South, accommodating 130 children and featuring a 1,000 square metre ground level, tree-lined playground. Mr Walker added that a major factor in the success of the five-tower project had been Walker Corporation’s willingness to create customised solutions for tenants looking for efficient, productive and comfortable space for staff, clients and customers. Collins Square has so far directly created more than 3,500 jobs, and Tower 2 will allow for the employment of a further 1,200 workers through to 2017.